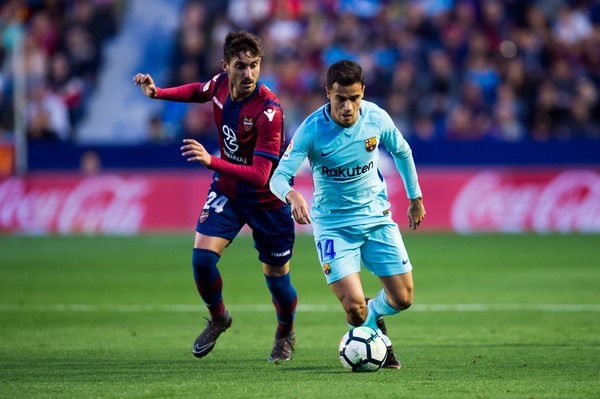 MADRID — Philippe Coutinho hit a hat-trick but could not save Barcelona’s unbeaten season as the Catalans were left stunned by an extraordinary 5-4 defeat to Levante on Sunday. But Levante held on for a thrilling victory, which ends their opponents’ hopes of becoming the first ever club to finish a 38-game La Liga season as invincibles. It was 1932 when the last side, Real Madrid, went unbeaten in the top-flight but even that was across only 18 matches, in a 10-team division. "We are angry not to have come through this game and not to have the opportunity to finish unbeaten," Valverde said. "But in a season some matches go your way and some don’t. I think this result was harsh in all respects but at other times this season, like in Seville, we could also have lost." This defensive collapse was reminiscent of their Champions League meltdown against Roma, which has soured an otherwise successful campaign. The unbeaten record was supposed to help atone for the European failure. "Obviously we wanted to finish the league undefeated," Sergio Busquets told beIN Sport. "But this does not take away everything we have done otherwise this season - everything we have achieved in league, the run we managed across two seasons - but, it is a shame." For Levante, this is their eighth win in 10 matches under new coach Paco Lopez, who took charge with the club in danger of relegation but has overseen a remarkable transformation. They move up to 15th. When Boateng brought down Busquets in the area and Suarez drove the penalty down the middle with 20 minutes left, it felt inevitable Barca would find a fifth.